With over 70 million facebook public pages and millions of real-time conversations every digital minute of everyday there are bound to be conversations that would benefit from your product and/or service within the Auto Service Market Would it be beneficial to know when someone just had an auto accident, had auto problems, got a new job, bought a new car, moved, had a baby, bought a house, had a teenager, or simply need auto services? These conversations take place every moment online and ailign is the tool to listen to them in real-time. 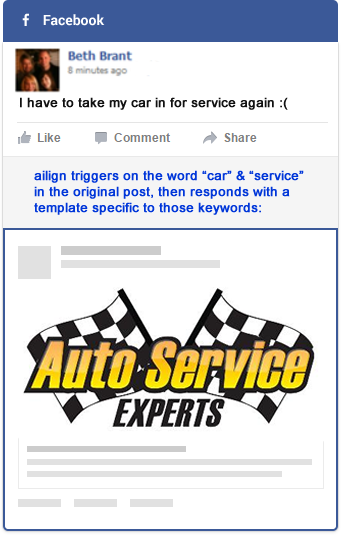 Car repair: 186,408 people talking about this! !